The world’s greatest productivity experts claim that when we control our energy we get a new lease on how time affects us. 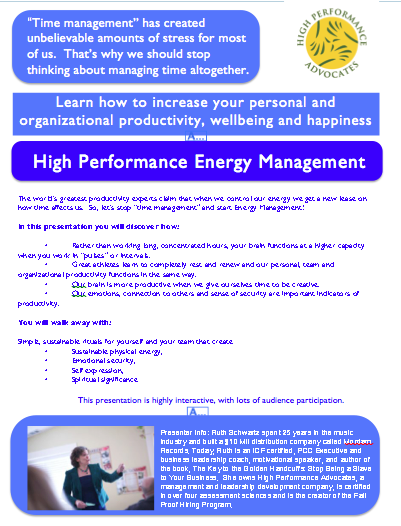 So, let’s stop “time management” and start Energy Management! •Rather than working long, concentrated hours, your brain functions at a higher capacity when you work in “pulses” or intervals. •Great athletes learn to completely rest and renew and our personal, team and organizational productivity functions in the same way. •Our brain is more productive when we give ourselves time to be creative. •Our emotions, connection to others and sense of security are important indicators of productivity. This presentation is highly interactive, with lots of audience participation. Stop reading and sorting through resumes. Stop calling to set up interviews. And for the love of your soul, stop using your “Gut” to make a decision. Fail Proof Hiring isn’t a cookie cutter recruiting process. It is a simple system that works over and over again. After building my own $10 million business I developed a proven process to help anyone bring the right people to free your time, energy, and skills to grow or streamline your business! 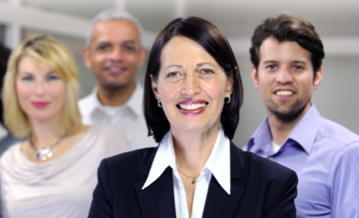 Quickly create a job profile that includes behavior, skills, experience and culture match. Save time, automate and screen candidates, five ways, before you even meet them. Take an uncomfortable conversation, the interview, and turn it into an enjoyable, relaxing and productive meeting. Replace hiring by gut instinct with a system that works every time. All the tools and concepts you need to revolutionize your hiring process. 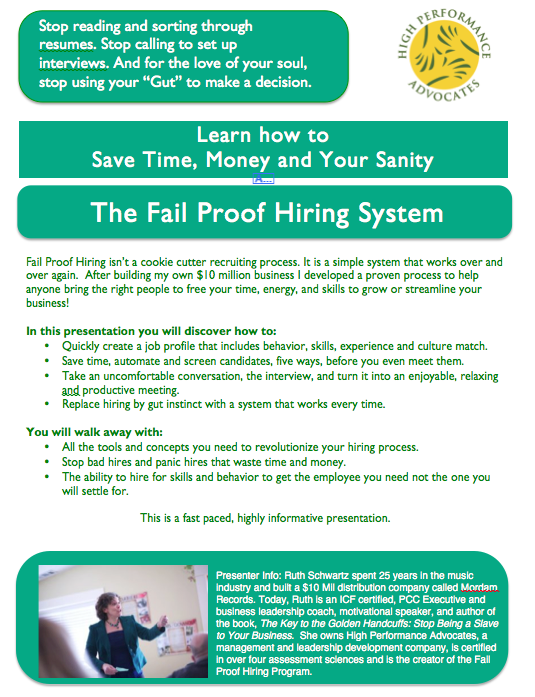 Stop bad hires and panic hires that waste time and money. 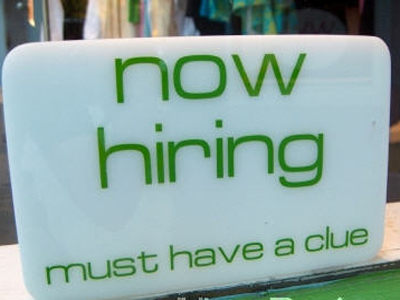 The ability to hire for skills and behavior to get the employee you need not the one you will settle for. This is a fast paced, highly informative presentation. Your customers are on information overload. If they don’t make a connection with you, they will walk away before the deal is made. 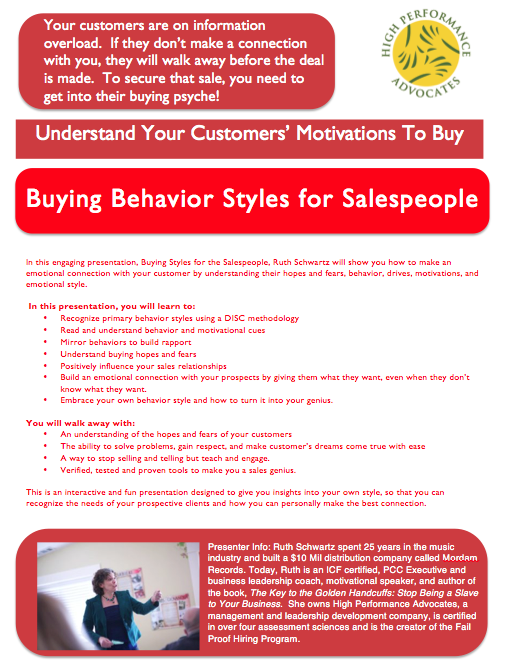 To secure that sale, you need to get into their buying psyche! 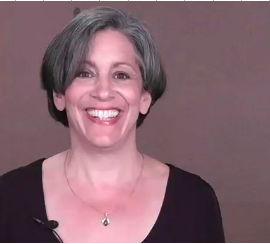 In this engaging presentation, Ruth Schwartz will show you how to make an emotional connection with your customer by understanding their hopes and fears, behavior, drives, motivations, and emotional style. Build an emotional connection with your prospects by giving them what they want, even when they don’t know what they want. Embrace your own behavior style and how to turn it into your genius. A way to stop selling and telling but teach and engage. This is an interactive and fun presentation designed to give you insights into your own style as well as your customer. Fill in your name and email. I will personally get in touch to talk about your groups’ needs. Ruth Schwartz spent 25 years in the music industry: 10 years on the radio, owned a publishing company, a syndicated radio program, producing records, and running a mail order company. In 1983, Ruth started and built a $10 Mil distribution company called Mordam Records. 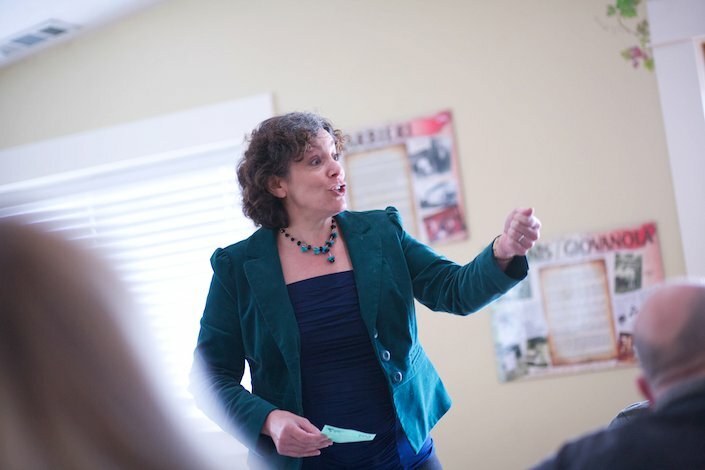 Today, Ruth is an PCC certified, business leadership coach, motivational speaker, and author of the book, The Key to the Golden Handcuffs: Stop Being a Slave to Your Business. She owns High Performance Advocates, a management and leadership development company, is certified in over four assessment sciences and is the creator of the Fail Proof Hiring Program. "I help help leaders to identify and articulate their unique leadership genius and then create the organization, team and life they truly want."